Get all the latest techniques, tips and advice to help you improve your work with this brilliant new practical art magazine. Paint & Draw is the brand new monthly magazine that’s ideal for anyone who loves making art. It’s packed with great advice from experts, and full of fresh ideas to inspire beginners and accomplished artists alike. A whole range of media are covered, from watercolours to charcoal drawing, from acrylics and pastels to oil painting and coloured pencils, with workshops on how to perfect your techniques. In addition to all the great pointers inside, you’ll find all the inspiration you need. Discover fascinating new settings and subjects for your artwork, and new ways of sharing it with others. In issue one, Sylvia Paul conjures up a stunning floral still life in acrylics, while Jem Bowden paints an autumnal seascape in watercolours. For animal lovers, Jill Tisbury expertly draws a Chinese leopard in pastels, and we’ll show you how to digitise your artwork so that you can post it online or have prints made. There’s plenty more, including a celebration of the art of Edinburgh, while French Canadian painter Guillaume Menuel creates an atmospheric street scene in Montreal. We’ll also take you behind the scenes with a whole range of top artists. You’ll get to look inside their sketchbooks, go into their studios, find out about what inspires them, and learn about how they paint – step-by-step. Subscribe to Paint & Draw today, and guarantee yourself a wonderful dose of creativity every month. Win a year's subscription to Paint & Draw! As a special launch offer, we're giving one one lucky reader the opportunity to win a year's subscription to Paint & Draw. Simply enter your email address below to be in with a chance of winning. Good luck! Entries must be received before 30/11/2016. The winner will be selected at random, notified within 28 days of the closing date and will be required to give details of a delivery address in the UK to which the prize should be sent. For full terms and conditions, please go http://www.futureplc.com/competition-rules/. Get the first 3 issues of Paint & Draw for just £5! 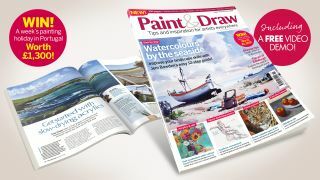 Trial the first 3 issues of Paint & Draw for just £5! If you like it, your subscription will continue at just £11.00 every quarter by direct debit. Pre-order now, you'll receive issue 1 on/around the 20th October.